Which Type of Animal Assisted Therapy Is Right for You? Hospitals and other facilities have started to realize the benefits of using animal assisted therapies to help improve the health of their patients. The use of animals to assist in therapies both for physical and mental health conditions has been a breakthrough, and it looks like it will boost healthcare positively in many areas. As medicine and our society changes, it becomes clear that a patient’s state of mind can help to assist them in recovery from all sorts of health problems. Let’s check out the ways that therapy animals are being used in traditional healthcare settings below. This might sound like a strange one, but many of us have a fear of the dentist that actually drives us to avoid attending for a checkup or dental work for years. This is terrible news for our teeth, and dentists are realizing that by offering therapy animals during stressful visits, patients can be helped to relieve their anxiety and take better care of their oral health. Cancer treatment can be unpleasant, scary, and a long process. Therapy animals provide emotional support to patients undergoing cancer treatment by lifting the mood and providing a stable emotional presence. 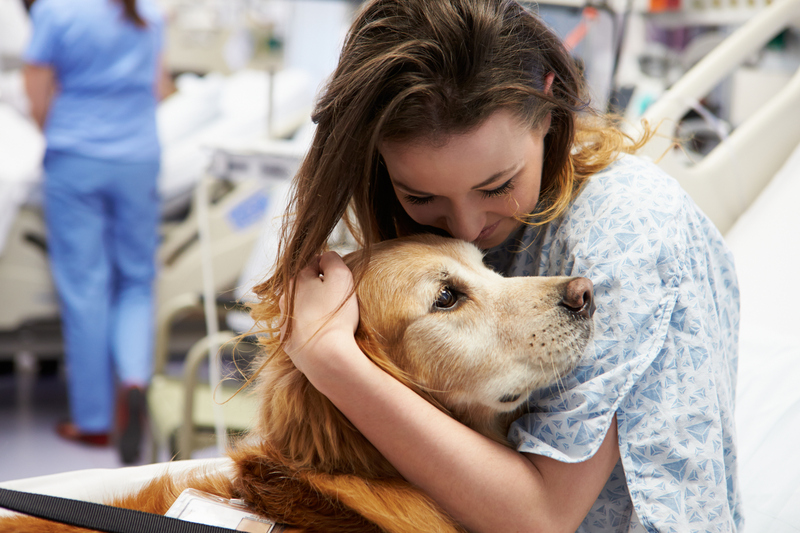 For more information about how animals support cancer patients, please see our article in conjunction with the Human-Animal Bond Research Institute (HABRI). Staff in facilities that have begun to use therapy animals with their residents say that the results are astounding. Research show residents living with therapy animals are more active, leading fulfilled and happier lives. Pets not only provide companionship and alleviate stress, they also can serve as medical alert animals and provide a sense of security. Dementia patients can decline quickly in what can be a heartbreaking change for many families. But research is proving that therapy animals can assist those with dementia by reducing anxiety and depression in such patients markedly. Therapy animals are proving to be a powerful force in the mental health field at the moment, with a range of benefits to patients with disorders ranging from anxiety to PTSD. Veterans often return from their service affected by traumatic experiences, leading them to develop Post-Traumatic Stress Disorder (PTSD). Psychologists recommend service dogs as part of treatment for this disorder to help rehabilitate veterans affected by it. There are also charitable programs set up, such as K9s for Warriors, which aim to match veterans with rescue dogs that function as emotional support animals. Individuals that experience anxiety and depression can often struggle with day-to-day tasks that many of us find simple. Using therapy dogs as part of a treatment plan for those with mood disorders assists them to feel more comfortable and reassured in their everyday lives. Therapy animals have shown great promise in treating those with addiction, for a number of reasons. Therapy animals can definitely help to emotionally support owners, but also having a pet is generally incompatible with being an addict. Those with pets or therapy animals are obligated to stick to a routine for the well-being of their pet. The value of therapy animals in treating all sorts of different patients is a huge revelation in medicine. Our four-legged friends have been shown to have a huge impact on our health—both mental and physical. This content provided by CertaPet. CertaPet is an online platform that connects patients, who are seeking recommendation letters for emotional support animals, with Licensed Mental Health Professionals who are familiar with the benefits that animal companionship can have on a person’s emotional and mental well-being.